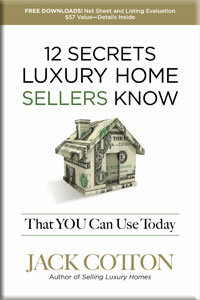 Backed by his more than three decades as one of the most respected and sought-after luxury real estate professionals in the United States, Jack Cotton shares his vast knowledge and expertise through three informative books: Selling Luxury Homes, 12 Secrets Luxury Home Buyers Know, and 12 Secrets Luxury Home Sellers Know. Agents learn the most important facets of entering and mining the luxury real estate market; from understanding and cultivating high-end clients, to developing the specialized pricing, listing, marketing and negotiating skills necessary, and on to the important process of retaining high net worth clients and becoming their trusted advisor. 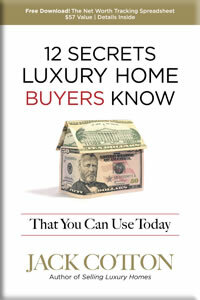 Consumers gain practical yet vital knowledge about buying or selling their luxury homes. The books emphasize the importance of setting goals, being aware of the market, what to expect from a real estate agent and advisor, preparing the property for sale, common buying and selling mistakes and much more. 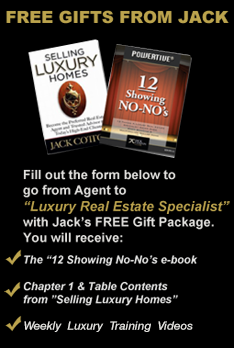 Jack Cotton's books arm the real estate agent with the information and confidence necessary to enter the world of luxury home buying and selling, or to vastly improve and embellish the methods he or she is already using in the high-end market. The books equip the consumer with the wisdom to find a trusted real estate agent and advisor, and to take advantage of the expert's knowledge in order to achieve the buyer's or seller's goals and objectives. . Check out www.JackCottonRealtor.com for all of your real estate needs. 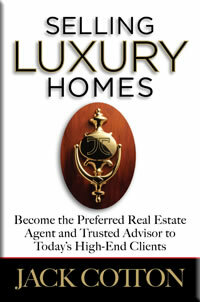 Last week, we underscored the often overlooked importance of business cards in Luxury Real Estate. This week, we will be discussing the pivotal role that newsletters play in Luxury Real Estate personal marketing. Last week, we explored how to leverage your personal brand in Luxury Real Estate. This week, we will be examining how invaluable business cards are. Even in a digitally dominated world, business cards are still a tangible thing that’s very important in this business. Over the next few weeks, we will be examining the various staple and creative marketing strategies to help you generate more clients, profits, and exposure in Luxury Real Estate. This week, we will first underscore the importance of your personal brand. Last week, we examined breaking through to your first listing. And now, after a long battle, the house is listed at the right price and at the right fee. Now, we need to get it sold. 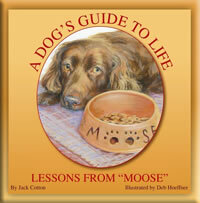 Last week, we discussed the big “O” and how to overcome objections through numerous strategies. This week, we will be exploring the big one: getting your first listing. Last week, we examined how paramount processes are when it comes to exceeding client expectations and breaking into the Luxury Real Estate market. This week, we will be talking about overcoming the big “O”.